As per sthalapurana, the Lord removed the curse on Nandi and hence called Nandipuram and the Lord Nandinathan. Thirumangai Azhwar says ' Nandi panisaida naga ( place where Nandi performed his duty service or kainkarya). As per sthalapurana, the Lord who initially was facing east turned west to see Sibi Maharaja sacrifice his life to save the life of a Pigeon. As this palce is like puri Jaganath temple of North Inda, it is called as Dakshina Jaganatham. 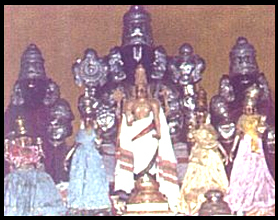 Dieties Vinnagara Perumal, Jegannathan Natha Nathaperumal, Shenbaga Valli. Access to the temple About a mile from Kumbakonam. It is better we hired a car. Bus facilities are scarce here. The Moolavar of this sthalam is Sri Vaikunda Nathan. Other name of the Perumal is Thamarai Kannudaya Piraan. The Moolavar is in the Irundha (Sitting) Thirukkolam facing his thirumugham towards east direction. Prathyaksham for King Uparisaravasu and Udhanga Maharishi. This place is in the Thanjore district of TamilNadu. From Kumbakonam first we have to reach Korukai by bus and from there the temple is situated at a distance of 1 1/2 kms.